> Playing things safe is a natural tendency for many people. Taking risks has bitten us more often than not. Armchair quarterbacking has been replaced by the safer second-guessing that comes from the sofa. “It’s too dangerous!” is a good thing to say to precocious children, but, if we’re not careful, we may oversell fear to the point that children, or any of us, aren’t given the permission to risk and fail. Risking failure is at the heart of maturity. Wisdom comes from experience, and the only way to get experience is to try something. Three days of solitude and fasting ended the next morning as I was led back to the group gathering area. All of us were treated to lentil soup and hot tang to reaccustom our stomachs to food. Everyone seemed cleansed, purified, and peaceful. It was great and it was needed. 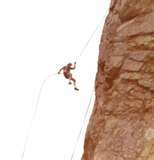 The risk was worth its reward, and it was good preparation for what came next, rappelling down Mt. Jo.